THE CHICKEN RUN Small Yard Shelter is for raising range poultry for meat, or producing farm fresh eggs, while fertilizing your lawn, garden or pasture. 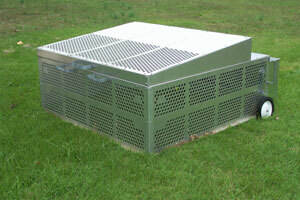 The Chicken Run is the finest portable range chicken shelter on the market today. Small Yard Shelter: Size 5' Wide x 5' Long x 21" High. Holds approximately 15-20 broilers or approximately 15 laying hens. The Small Yard Shelter includes one 1/2 solid and 1/2 perforated hinged access cover, two solid panels, two perforated panels, and two retractable wheels. Two handles for lifting to move. Two handles for lifting to retract wheels and a handle for the access cover. 60% of top is covered to provide shade for birds. Raise range chicken protected from predators. Can be easily cleaned and sanitized with sanitizer and a water hose. nest boxes even during winter months". "No more mowing between trees in my orchard". "My 4 year old son loves gathering eggs from the boxes. So easy"
This our small yard shelter. The shelter is 5 ft. x 5 ft. which 1/2 the size of our standard shelter. 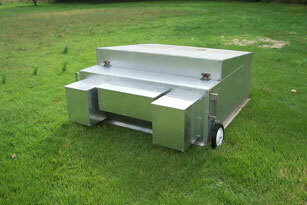 Features include 60% covered top as well as large 4 ft opening. Constructed of aluminum and zinc plated hardware for years of service.